A prominent missionary personality was given unhindered airtime, 25 minutes, beginning at 9:15pm, permitting him to reach out to listeners in Israel and around the world with his video broadcast during prime time. Yad L’Achim’s Rav Sholom Dov Lifshitz Shlita did his utmost to prevent the broadcast, or at the very least, to have an opposing view aired as well, hoping to dilute the heretic message of the prominent individual but the program arranged by Rino Tzror went on as scheduled, granting the missionary a private stage with a broad audience. 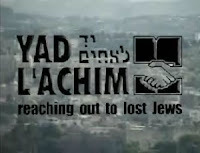 Yad L’Achim sent urgent requests to the Prime Minister’s Office, Ministry of Education and Ministry of Communications, but to no avail. He asked that at the very least, they use the weight of their office to ensure an opposing [Torah] viewpoint be aired as well. Ultimately, the urgent requests were ignored, with event organizers explaining that the speaker was expressing personal views, not that of a missionary organization, hence his broadcast is permitted. The personality was introduced at the start of the program as a “messianic Jew” who heads a community in the Jerusalem area. The broadcast began with a question and answer session, and it was a far cry from an individual expressing his private views. He addressed Christianity, as well as his following, the size of his community, the source of funding, how one can donate and other tidbits that permitted him to promote his anti-Torah message, community and make an appeal for funds as well. Following the broadcast, R’ Lifshitz turned to attorney Avigdor Dagan, the legal advisor of Israel Television “Educational TV” department, questioning the judgment of officials for permitting such a broadcast. Dagan denied that the program contained missionary content. Yad L’Achim attorney Moshe Morgenstern sent a letter to Dagan citing the long list of violations of the law contained in the broadcast. He also pointed out the poor timing of the program, during the evening hours when children around the country are awake and in front of computers. Rav Lifshitz explains that until such time the anti-missionary laws are amended, those seeking to destroy yiddishkheit will find a suitable stage in Israel, calling on MKs to use their authority to amend the law immediately.